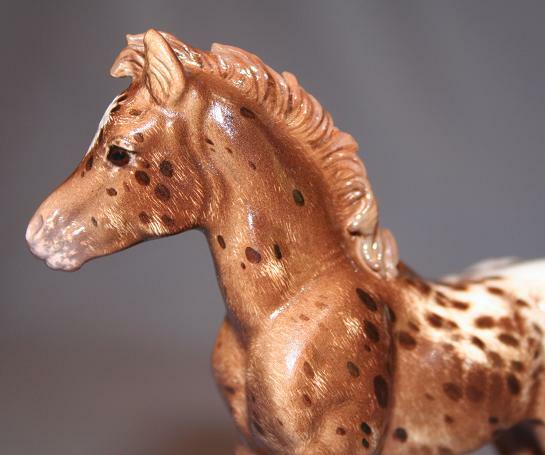 This is a one of a kind claybodied, custom reglazed Japanese knock-off of the well known Hagen Renaker "Butch" foal. 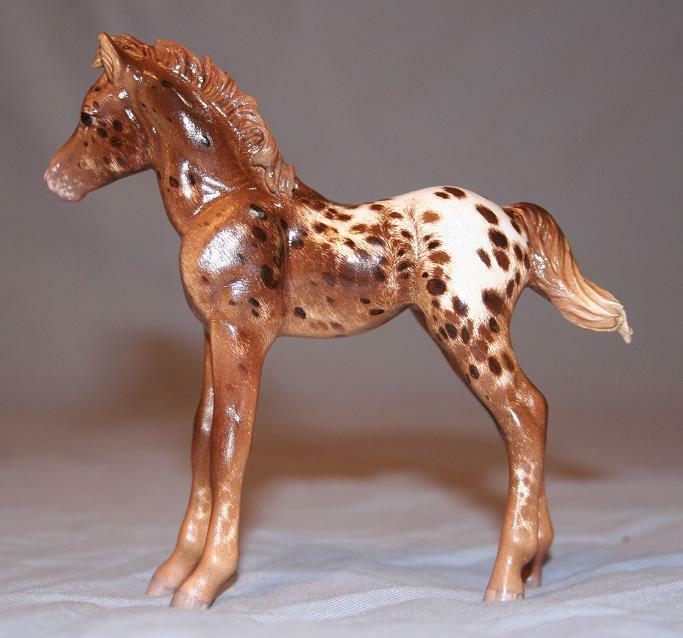 The original was sculpted by the late Maureen Love and produced as a classic scaled mustang foal to go with the mustang mare "Daisy" and the stallion "Commanche" for the Hagen Renaker company. Like many of Maureen's beloved sculptures, this design was illegally copied in the 50's and 60's by overseas manufacturers. Please let me be perfectly clear that this foal is NOT an original HR "Butch", but rather a reworked version of a Japanese copy of that well known sculpture. Produced in earthenware, this foal was originally a glossy pale buckskin. It has been painstakingly customized by Paige Easley Patty of Hanblechia Studio to a lovely sandy-cinnamon chestnut blanket appaloosa foal. This piece measures 4.25 inches long from nose to tail tip, and just less than 4.25 inches tall. Shown by the artist at Kristina Lucas-Francis's "Clinky Classic 2" ceramics only show early this past December, this foal took a 4th place in an incredibly competitive foal pony class and 2nd place with a NAN card in the Custom Glazed Appaloosa Workmanship Division under judge Heather Malone-Bogle - against some of the finest examples ever seen in this artform! Called "Escaper Caper" and shown as a Pony of the Americas colt, the new owner may retain his NAN card and information, or may change the name, breed, and gender however they choose. These photos are slightly off color and are more reddish than the actual piece, and slightly darker as well. 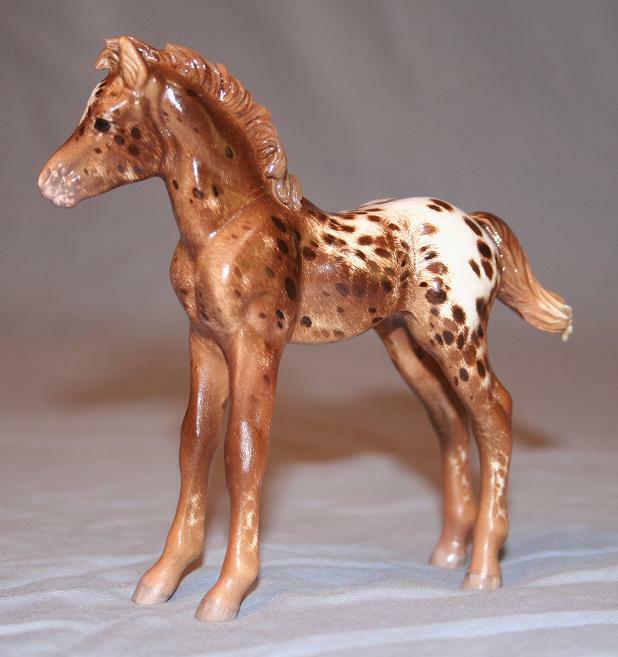 A claybody custom reglazed foal like this is fired repeatedly in the kiln at cones 04 and 06 and uses only earthenware clay, underglaze, and clear satin glaze applied over the original gloss glaze finish. No part of this foal is painted in acrylics or other non-fired media. 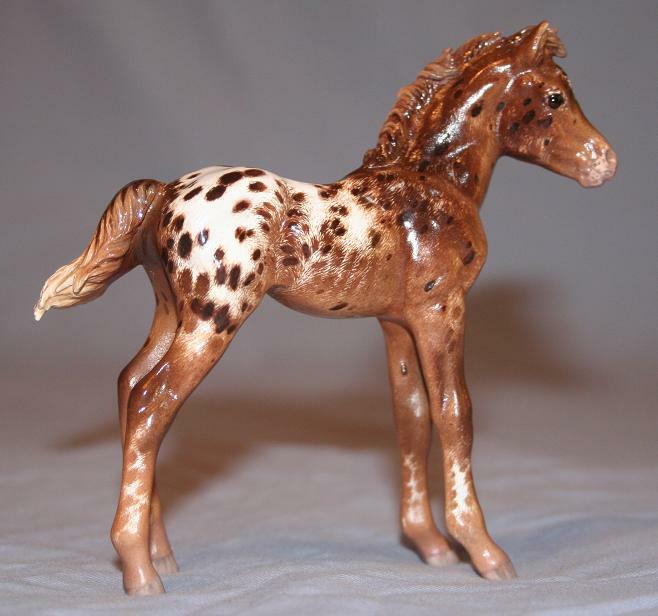 He sports an all newly resculpted mane and tail, redetailed eyes and nose, faint added hair pattern texture, appaloosa spotted coat with ticking, mottling, and striped hooves. 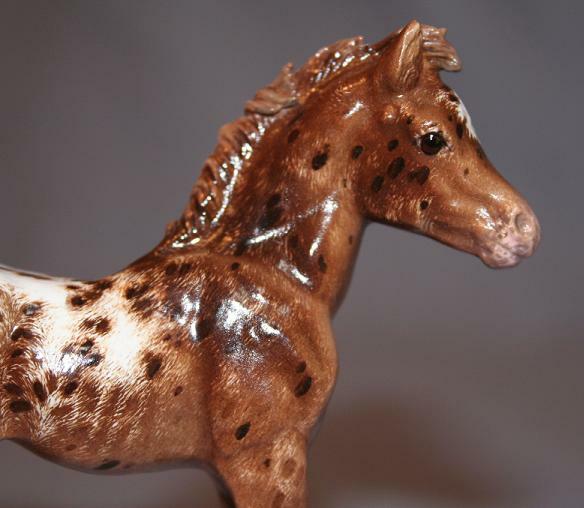 This artist's custom glazed equine ceramics are highly sought after pieces in the Model Horse Hobby and elsewhere. This particular piece is unusual in that this claybody work, underglaze, and clear glaze have been built up over the original glossy buckskin finish! Shipping within the USA is $18.00 for Priority Mail, double boxed with a custom cut foam block, fully insured with delivery confirmation. USPS Global Express with online tracking and insurance is available for overseas purchases - email for shipping quote. Any customs duties, VAT charges, etc are the sole responsibility of the buyer and I will not falsely mark the value on customs forms. I do NOT ship UPS or FedEx and this piece will require a signature. Payment is to be made in full within 7 days of auction closing via USPS money order (for US buyers) and I will ship once that payment has cleared my bank as being legitimate. I will accept payment via PayPal, and credit card payments via Paypal, from those who have 15 or more positive ebay feedback, not more than one negative feedback, and have a confirmed shipping address within the USA, UK, or Canada as qualifies for Paypal's Seller Protection Plan. All other overseas buyers must make payment in full with an International Bank Draft as Paypal from this countries can not be accepted. I retain the right to refuse payment by Paypal from anyone with questionable or low ebay feedback, or otherwise has a bad reputation on Model Horse Blab, MHHR, etc. I will check! If you have any question of payment I will accept, by all means please email me before the auction closes! TIME PAYMENTS may be accepted with at least 25% down, please inquire for approval for this option well before the auction closes or else it will not be accepted. PLEASE NOTE that there is a very fine heat-stress crack in the underglaze on this foal's lower left shoulder. It doesn't show up in the photos and is invisible under most lighting situations, but is a flaw in the otherwise lovely finish on this piece. The artist attests that this flaw appeared during the last firing and is due to the movement of the original gloss glaze beneath the added underglaze. This almost invisible flaw is very faint and is only cosmetic, and should not otherwise effect the quality or long term stability of this piece.